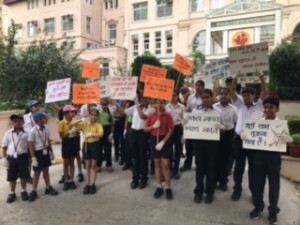 As part of an ongoing initiative, 15 children from Junior Aravali, accompanied by their teachers, joined 22 children from Senior Aravali for the monthly Plogging Drive on 20th July. Plogging comes from the words ‘jogging’ and the Swedish ‘plocka upp’ (to pick up). It means picking up litter as you jog yourself into shape. The platform called Ploggers of India, is promoting cleanliness through fitness. The drive started with a brief warm up. Then the children put on their gloves and got ready for plogging. They jogged to the Regency Park II road and were able to pick up many wrappers and plastic waste that lay along the connecting walkway. Once they got to the main road, they were shocked to see the litter lying in all corners. Both the juniors and seniors got to work, coordinating well as a team and picked up all kinds of litter like disposable cups and spoons, plastic bags and foil wrappers. In the end, they had 6 bags full of garbage that they had managed to collect. The shopkeepers, who had seen the ploggers picking up litter before, were intrigued and asked the children what they were doing. The children took the opportunity to explain that each of us has a responsibility of keeping our environment clean. They, by participating enthusiastically in the Plogging Drive, had set the perfect example of just that.